I found myself in Oslo last weekend. A small city packed with new and old and fashionably dressed blond women. I started with taking a ferry to Bygdøy, an area filled with museums and lovely Norwegian homes. Out of all the museums I visited, the Viking museum with an 1,100 year old completely preserved Viking Ship (pictured lower right) was the most interesting. The detailed wood carved ship was a piece of art in itself. 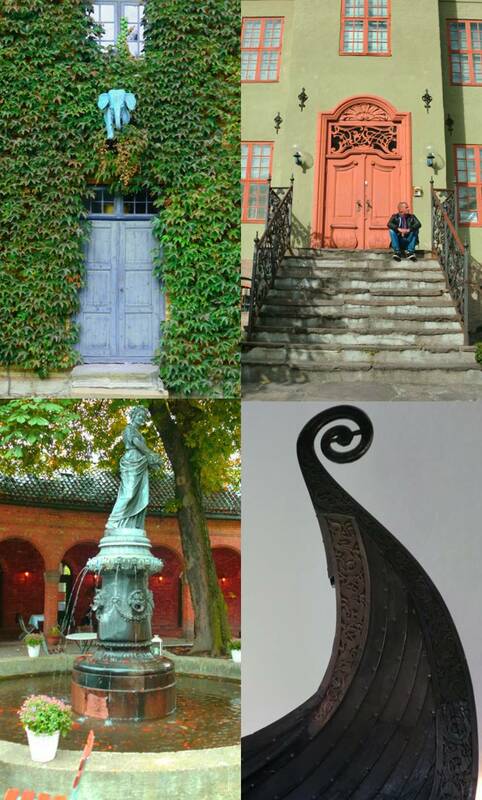 And walking from one museum to the next I couldn’t help my fascination with the Norwegian homes. They possess quite a pleasant Nordic charm. While running from museum, to palace, to castle, to shop, I kept my eyes out for a Kransekake. The link shows a Norwegian chef preparing this traditional almond circular cake, stacked high and decorated with Norwegian flags or ribbons. The Kransekake are usually made for weddings, Christmas or other special occasions and are astonishing beautiful for how simple they are made. 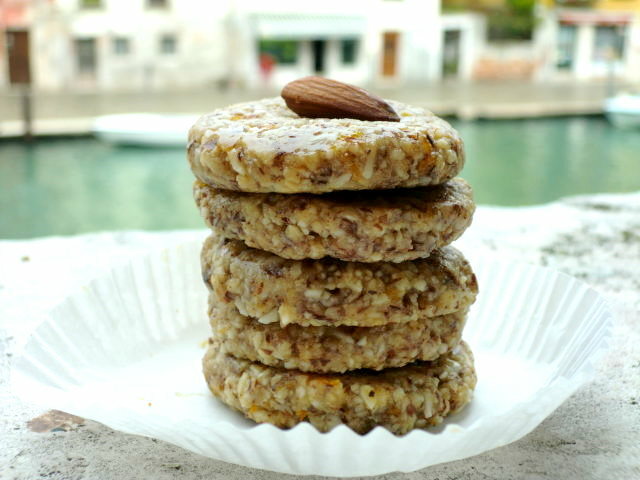 Once home I set to work creating these Almond Orange Cookies, my own simplified version. They turned out wonderfully chewy with a perfect almond flavor and a light orange kick. These lovely cookies are absolutely divine tasting, it is impossible to only eat one! Add all the ingredients in a bowl and mix with a spatula. Roll into 1 1/2 tbls size balls or cookie shapes and top with an almond. These are very sticky so it is best to separate them with plastic wrap and keep in the fridge. For a chewier cookies shape into cookies, top with an almond and dehydrate for 10-12 hours at 115 Degrees Fahrenheit. This entry was posted on September 27, 2010 by Olive. It was filed under Uncategorized . These look so cute! And really simple. WIll have to try them out! yay, patrick finally makes an appearance. almond cookies are perfect for fall. i want them with a cup of hot chocolate. I made these into small, flat, quarter-sized cookies. YUMO!! I am very new at “raw” creations. This is a keeper:) thanks for the recipe. I added a few drops of pure orange essential oil.